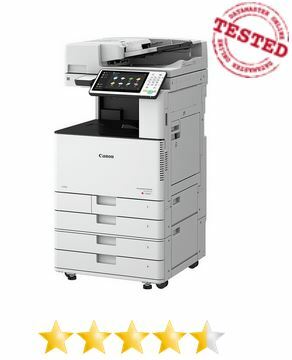 The Canon iR Advance C3520i, C3525i et C3530i A3 color multifunction printers have been through all the DataMaster Lab tests and evaluations. We are pleased to announce that they have obtained the very good rating of 4.5/5 stars. This range replaces the Canon iR Advance C3320i, C3325i et C3330i. The productivity of these machines in general terms is worth highlighting, particularly in duplex (double-sided) mode. They can print out onto both sides of A3/ledger at up to 6% faster than onto single-sided. They also motor through mixed media / mixplex documents, such as those with a thick cover. The fuser can change temperature at an impressive speed. The print quality of small black characters is good, but overall there is a lack of precision, chromatic noise, overdosing of black toner and a misty effect on photos.